There are many reasons why medical marijuana patients choose edibles over concentrates and smoking. Many medical marijuana patients have for example quit smoking cigarettes thanks to medicating with marijuana. Having that constant inhalation for some patients reminds them a bit too much of smoking cigarettes and decide to go to 100% edibles, tinctures, balms and lotions. Edibles have shown over the years to help with many eating issues including helping tens of thousands of cancer patients be able to keep their food down. Besides keeping your lungs free from smoke there are plenty of benefits for your body and not to mention the overall length of high and intensity you can and will receive while enjoying medical marijuana edibles. There are plenty of states that have legalized medical marijuana and even moving towards complete decriminalization. Edibles and concentrates however since they are considered “manufactured” ( by some localities ) tend to cause more issues than many vendors find them worth ( vendors provide mmj products to patients and collectives and are also known as a Caregiver ) because in some cities you have to deal with not only the medical marijuana licensing but also food services, baking and all the regulations that go with it. You will also incur more taxes dealing with edibles and as patients you will see some form of “tax” that is specific to edibles, drinks and other “manufactured” items that are not simply cured medical marijuana. Due to the quick ups and downs within the legalization laws of medical marijuana in each state and country it is always best to check with your local or state NORML chapter which you can locate by going to http://norml.org/chapters for the most up to date legal and political activism information in your state. 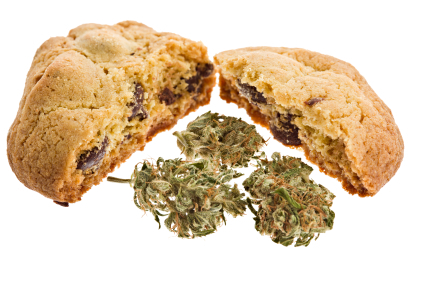 Why Edibles Over Smoking, Vaporizing or Concentrates? Edibles tend to be made using the popcorn buds, trim and left overs that you can’t get donations for ie: sell. There are many medical marijuana patients, vendors and collectives who make edibles out of A+++ Top Shelf Buds, Hash and even Honey Oil to further remove any “plant material” that would potentially contaminate the edibles themselves. The higher end edible recipes using top shelf buds, hash and concentrates will have far less of the “green taste” and if you do not understand what that means, keep reading as we go into further detail later in this article. Simply put, the less green taste your edibles have the more desirable they will be for mmj patients, especially those who tend to dislike the flavor of marijuana edibles. Why Should You Treat Each Patients As If They Are BRAND NEW To Marijuana When Providing Edibles To Them? If you are new to making edibles and are planning on providing them to other patients there are a few things that you need to be aware of. Most medical marijuana patients are new to edibles ( just like you might be ) and unlike smoking, edibles can be STRONG and they can last 2,3 and sometimes 4+ hours and for a first timer that can ( and does ) cause that paranoid and anxious feeling that strong Sativas can sometimes bring out. What you need to do is treat each and every patient as if they have never tried marijuana before. You have no clue what they have already eaten, drank or what medication they currently have in their bodies. Edibles can react and intensify with other medication ( prescription drugs ) and is something that should be made aware especially for untested edibles. There are many reasons to make edibles and if you are a grower it is by far the best use of your trim and popcorn buds. You will be able to provide other patients the benefits of eating marijuana versus simply smoking and inhaling it. There are plenty of medicinal benefits to eating marijuana especially when made correctly. The only cons are if you do not enjoy cooking or recycling your material or making more donations ( selling the medibles to patients and collectives ). In general collectives sell edibles for $10 to $20 a piece and will usually give the vendor half of that or purchase by the pan, batch or specific count. For more information on vending edibles, keep reading. As a medical marijuana patient who grows it is best to use any and all available plant material possible. Just like when you recycle your organic soil, why toss your sugar trim and popcorn when you can turn it into GOLD, well maybe not gold but close by making Canna Butter. With Cannabutter you will be able to make most any recipe that calls for oil or butter BUT turn it into a medically beneficial snack or meal. Always remember though when making edibles ( especially brownies, rice krispy treats and cookies ) to keep these AWAY from anyone who is not a medical marijuana patient especially children and for obvious reasons. Can Edibles Be The Cure For Cancer? While edibles are new to overall studies as far as their benefits there has however been many studies done showing the benefits of oils, tinctures and edibles in general with amazing results. There have been recorded cancer cure evidence specifically using “Phoenix Tears” which you can learn more about and how to make it at : http://phoenixtears.ca/make-the-medicine/ and don’t forget to watch the documentary “Run From The Cure” also found on the phoenix tears website. There are plenty of recipes out there but there are always those favorites that you can’t live without and this is ours. For most medical marijuana patients they love the canna rice krispie treats as well as marijuana brownies. Yes there are a ton of different recipes out there to make the best, to make the most strong, to make the most potent BUT this medical marijuana edible recipe is OUR favorite and worth trying out. Depending on how much marijuana, trim, hash, concentrates that you use will depend on how much cinnamon and sugar butter spread to use. It is common to use 1 ounce of bud to 1 stick of butter but with the cinnamon and sugar butter spread it is best to USE IT ALL as it is not 100% butter and it tastes AMAZING. Fill a pot with 6-8 cups of water and then toss your trim, popcorn bud, hash and whatever else you want to extract from in the pot. Make sure there is enough water to keep the material off the bottle of the pot and not burn. Bring it to a boil for 10 minutes at OVER 350 degrees to allow decarboxylation to happen ( it will activate the thc ) and then bring it down to 300 and add all of the butter and keep it LOW boiling for another 20-40 minutes and do NOT stir yet but you can push down any trim that pops up above the water. Once the top of the water mixture has a solid foam forming now you can pour out the entire mix through a piece of cheesecloth into a tupperware container. Put the container in the fridge with a top on it so you do not spill, bump or dump this “gold” medicine you created. After 12 or so hours you will see the water and butter separate but sometimes is totally done by sitting overnight. Once the separation has happened pour out all of the “bottom water” as it is waste water and there is ZERO thc or anything worth keeping in there anymore as it now resides in the butter itself. Take the cinnamon and sugar “cannabutter” and put it in a pot and melt it while adding a complete bag of marshmallows until they melt completely. Continue mixing this for 5 minutes until the butter and marshmallow mix becomes 100% mixed together. Toss in a cup or two of chocolate chips and continue mixing until everything is completely mixed. Get a mixing bowl and put the cocoa rice krispies in there and pour the CnS cannabutter/marshmallow mix in there and get each and every cocoa krispie piece nice and mixed in with the cannabutter. Once everything is nice and mixed grab yourself a pyrex pan and pour the entire mix out until it fills up the entire pan. You will need to wait before cutting as the marshmallow needs to harden up a bit first. You can leave them flat OR do like we do and make 2” balls and wrap them in wax paper and store them in an airtight rubbermaid container in a cool dry place ( any cabinet, shelf or drawer will do ) but out of reach of kids and non mmj patients. These are some of the best “medibles” that you will ever have and can be potent ( depends on quantity and potency of meds you put in ) so try a piece and wait an hour as sometimes it can take 30 minutes + before they kick in, and kick in they will. Do NOT put these in the fridge when done as they will turn ROCK HARD. If you have too much of a plant taste to your edibles there are a few things you can try next time. You can boil with more water during the butter / water boiling portion since the active ingredients will be absorbed into the butter however the plant material will be kept with the water in the end. Another great tip is to first extract your cannabis by using bubble bags, bho extractors, dry sifters or other options to first remove MOST of the plant material before mixing with water and or butter. This will remove 95% + of the green taste and is what separates many of the vendors hoping to sell to collectives. So Is There Anything Else I Need To Know About MMJ Edibles? Just remember to check all local and state laws regarding medical marijuana edibles, concentrates and extracts as some look at them the same way as they look at “manufacturing” and even though edibles can and most times are more medicinal than smoking there are many confused politicians locally on up. Also start with small portions and work your way up with edibles always. Each and every persons tolerance to edibles varies and at times drastically so as always be safe with this amazing herb. ould you be concerned about exchanging links? Enjoyed your info about them medible industry. A lot of the info did argue why there is a need to get into the industry. I’m further along and am looking for license information. You mention needing a license to manufacture and needing a license to sell. Can you provide additional info? Do you have specific info for entrepreneurs in San Francisco, because I know it varies city to city. What does your program specifically offer to students? Thanks in advance for any additional info. came upon exactly what I needed. I most definitely will make certain to do not overlook this site and give it a look regularly. When making edibles, and labeling them how does one find out the accurate dosage and how potent and edible batch is? I know when testing nuggs each flower can very..same apply for edibles? I found kits, but are there labs that will test your edibles and tell you the potency? I am in the midst of starting a specific type of medible business. Would love investors. please email me at psgural@gmail.com for more information. I love the new easy butter maker! It’s a small infused butter maker!!! I can have my canna butter within 10 minutes for my husband but I like my cannabutter stronger so I rerun it again and wow…. I make pancakes or toast in the morning to dinner at night. I am a professional chef and I want to know if they would be away to become license and only do the edibles as wholesale items to the various stores? Hello cheffettekk.. were you able to find any more info on your question? Hi! How can i get marijuana edibles without RX ? Thank u! Water boils at 212 degrees….. How do you boil water over 350?? Magic water? I can’t believe what I just read… Did you say to use an oz of marijuana to one stick (1/4 cup) of butter? That is silly. I use an oz of mmj to a pound of butter and my treats are still strong. You are gonna get SICK if you use your ratio. You also didn’t mention that you only need to use 4Tbsp of butter In a rc treat recipe. I use 2 sticks for every oz. I buy cookie mix and get about 20-25 cookies per oz. Still takes me 4 cookies at once on an empty stomach to get STONED TO THE BONE. Previous post: What Is A Medical Marijuana Delivery Service?